San Antonio Spurs Could Go Undefeated At Home This Season : The Two-Way If the Golden State Warriors win their last three games of the regular season to reach 73 wins, they'll break the 1995-96 Chicago Bulls' record for most wins in a season. The Golden State Warriors Are On The Brink Of History — Will They Go For It? 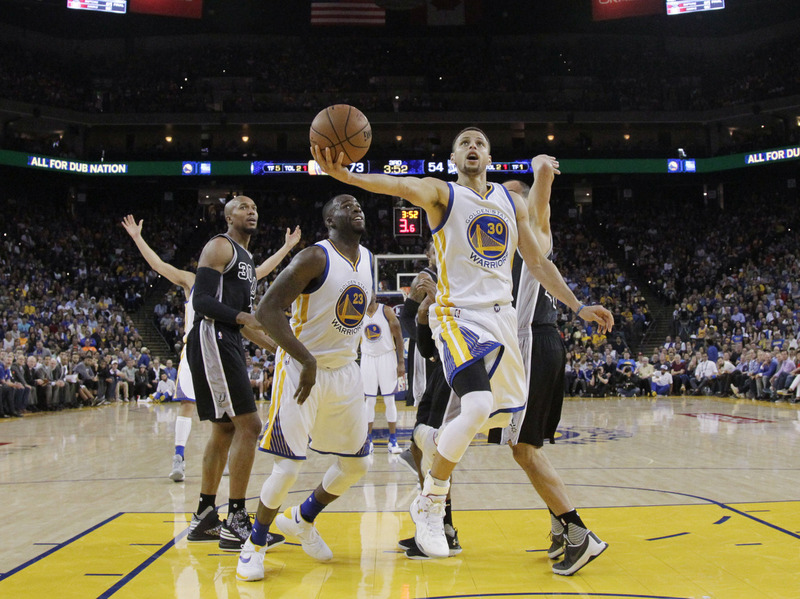 Golden State Warriors' Stephen Curry drives to the hoop during Thursday's game against the San Antonio Spurs. The Warriors won 112-101. Only three wins separate the Golden State Warriors and NBA history. On Thursday night, the Warriors beat the San Antonio Spurs to become only the second in league history to win 70 games in a season. If they win all three of their remaining regular season games, they'll break the record for most wins in a season (72) held by the 1995-96 Chicago Bulls. But now that Golden State has clinched the No. 1 spot in the Western Conference, head coach Steve Kerr says he's "inclined" to rest his best players, potentially forgoing the glory in exchange for physically fresher players in the playoffs. Kerr has said that the team — which started the season 24-0 and has lost only nine games total — isn't pushing for the record, telling USA TODAY Sports earlier in the week, "We'd like to get it, but we're still resting people and trying to get us set up for the playoffs." But after Thursday's win, with the record inching ever closer, Kerr said he was going to speak with his players about pushing for a place in the history books. "We are going to talk about it tomorrow," Kerr said, according to ESPN. "We've been putting it off for as long as we were able to, which was until we got the 1-seed. Now that we have that, I'm inclined to give some guys some rest if they need it, but I've sort of made a pact with the guys that if they are not banged up and they are not tired and if they want to go for this record or whatever then — so we got to talk." Golden State plays the Memphis Grizzlies on Saturday in Memphis, the Spurs on Sunday in San Antonio and the Grizzlies again on Wednesday in Oakland. In the teams' first two meetings this season, the Warriors beat the Grizzlies by 50 points and 16 points, respectively, so a loss in either of those games seems unlikely. According to FiveThirtyEight, the Warriors have an 80.5 percent chance to beat the Grizzlies on Saturday and a 92.4 percent chance to beat them on Wednesday. The Spurs, however, present a challenge. Not only are they second in the Western Conference, last month they beat the Warriors in San Antonio. Plus, the Spurs are playing for their own record. If they beat the Warriors on Sunday, the team will be one win away from going undefeated on their home court this season. Fox Sports writes that the 1986 Boston Celtics went 40-1 in Boston; the Bulls went 39-2 in 1996 and 1997; and the Cleveland Cavaliers went 39-2 in 2009. If the Spurs can win on Sunday and beat the Oklahoma City Thunder on Tuesday, they would be the first team in the history of the NBA to win every home game in a season. 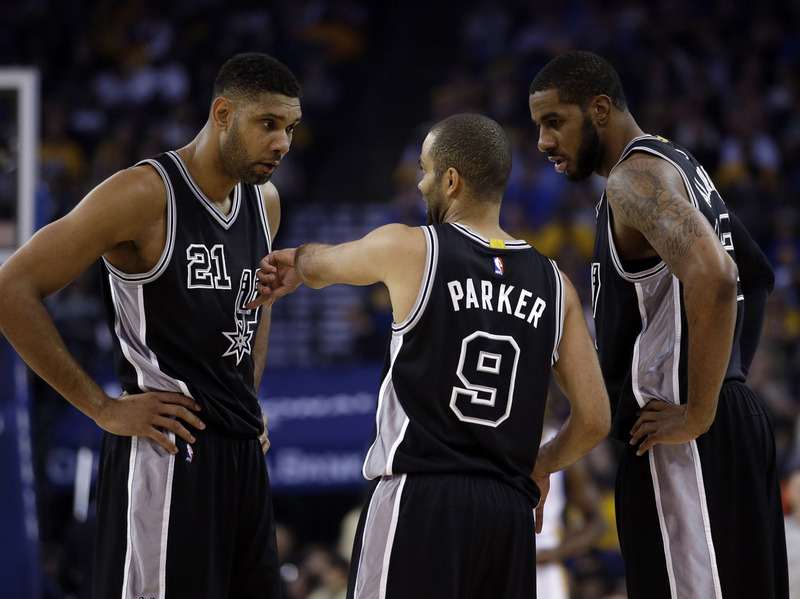 (FiveThirtyEight gives the Warriors a 29.2 percent chance to beat the Spurs). So, it's record pitted against record; No. 1 versus No. 2. And one team, at least, is nonchalant about its history-making opportunity. The San Antonio Spurs are just two home wins away from being the first NBA team to go undefeated on its home court in a season. "We don't talk about it or talk about the streak or the record or anything like that," Spurs forward Kyle Anderson told Sirius XM NBA Radio on Wednesday. "We just want to be playing the type of basketball we're playing when it comes close to playoff time. We don't talk about it or think about it." The Warriors' players are definitely thinking about it. "I'm only 26. When I'm 36, I'll be looking to rest more," guard Klay Thompson told reporters after Thursday's win. Forward Harrison Barnes agreed, according to ESPN: "I'm 23, so I've got no problem playing the rest of these games, and we'll go from there." Warriors' guard and NBA superstar Stephen Curry was on board as well. "We wanted to take care of tonight and clinch home court for the playoffs, [which] was a goal of ours," Curry told reporters on Thursday. "With three games left and 73 still there, it's obviously a lot to play for."